A great way to learn about our series! Now a super value. 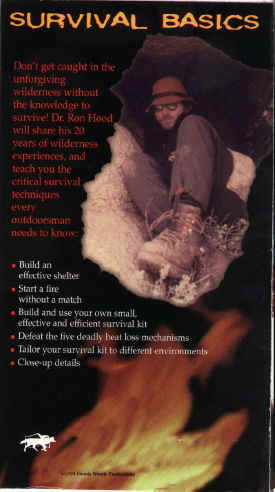 Both volumes of Survival Basics on ONE DVD! You get 134 minutes of super quality video instruction for only $16.95! This DVD has 31 chapters for easy access to information. Great for scouts and schools! We finally did what many of our visitors wanted... put together a comprehensive, yet inexpensive, set of survival skills videos. We call these videos Survival Basics because that's just what they are. We took about 20 minutes of the most technique focused material from each of our Woodsmaster videos and compiled this material into a two video set. This set doesn't hold a candle to our original Woodsmaster videos but they give you the opportunity to see what is on each of the Woodsmaster volumes and to learn basic survival skills at the same time! They are an incredible value! 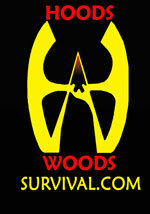 You will gain valuable knowledge about the basic and most important survival skills. Survival Basics will give you a preview into the more valuable Woodsmaster Video Series. You can learn first hand just what goes into each video and how it is presented. has the essential material from Volumes one through three of the Woodsmaster Video Series. 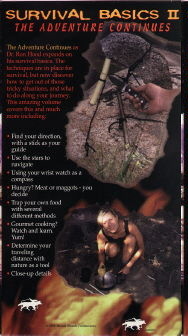 focuses on the skills found in Volumes four and five of the Woodsmaster Video Series plus Karen Hood's Cave Cooking! Gourmet cooking? Watch and learn. Yum!